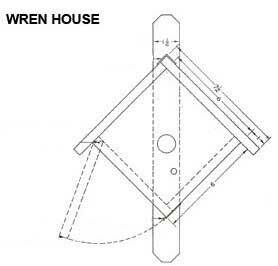 2 wren bird house plans to choose from. 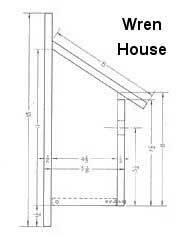 Click on one of the pictures below to go to the wren house plans. Wrens aren't picky about their homes; they'll live in anything from an old shoe to an abandoned bird house or a hollow gourd. However, everyone likes a neat little place to call their own, and these perky little guys are no different! Building a birdhouse for your wren neighbors is a simple woodworking project, and you can be sure that it will be appreciated. Male wrens build several nests in order to attract a female. If you find that your house has been abandoned, clear it out, so it's fresh and ready for another round of courtship from a new bachelor bird.